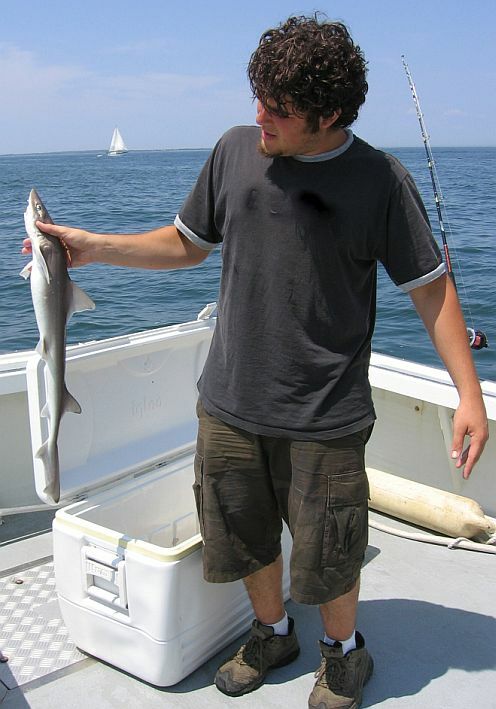 On Long Island dogfish and skate are generally thought of as junk. They ruin the fisherman’s day and are thrown back in disgust. Because these fish are meaty, tasty, and boneless they are actually very good to eat and really don’t deserve their junk status. If we had a better appreciation for these fish we’d have more fun, have more to eat, and there would be less pressure on more traditionally targeted species like flounder and fluke. Fishing regulations on Long Island get tougher every year, and there are increasingly more bad fishing days than good. In light of these ever increasing restrictions on popular game and food fish I’d like to suggest something that might make a bad day fishing a little better: Keep and eat your junk fish. I can hear the moans already. Sure, landing a skate is just not the same as pulling in a doormat or a nice size striper, but going home empty handed is no fun either. 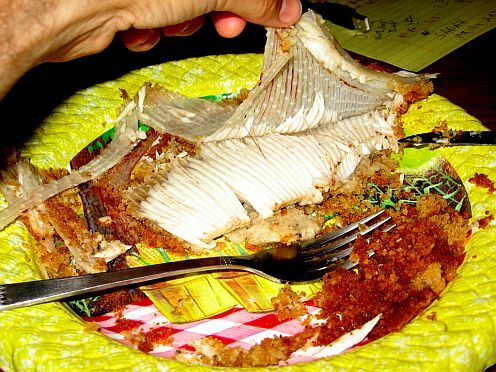 It turns out that two of the most annoying fish around, dogfish and skate, are pretty good eating. If that’s all you’re catching why not bring them home and cook ’em up? 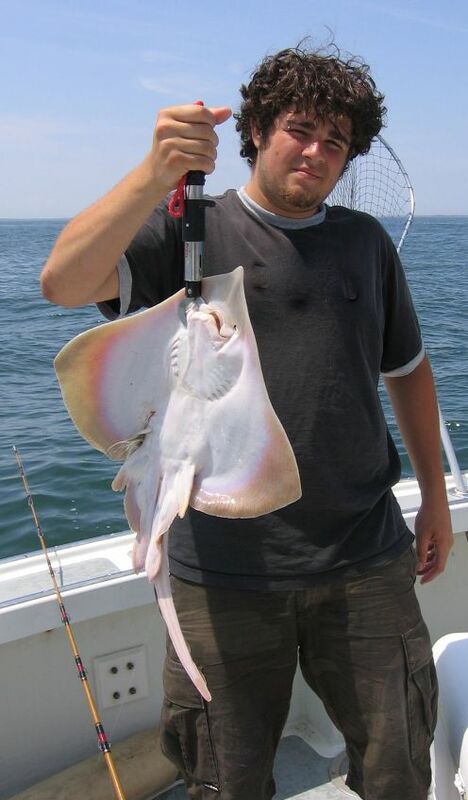 Skate is one of the ugliest fish you’ll ever catch in Long Island waters. Most people throw them right back into the water, but I keep them. They’re good eating and if you put them on top of your head they’ll wrap their wings around your ears like a bomber’s hat. My son Joe holding a skate. I wanted him to put it on his head, but he was worried it would mess up his hair. I don’t wear my skate hat much, but I do eat them when I catch them. The meat is tender, tasty, and there are no bones to fuss with, just a thin layer of cartilage separating the muscles in their wings. Before we go any further let me tell you that sea scallops do not come from skate. It’s myth that many have heard, but is absolutely false. 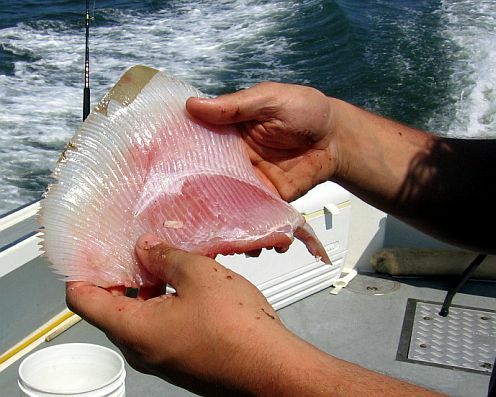 You can see from the pictures here that the muscle fibers in the skate wing are completely different than those in a sea scallop. There’s no way one could pass for the other. And the flavor is different too. Enough said. 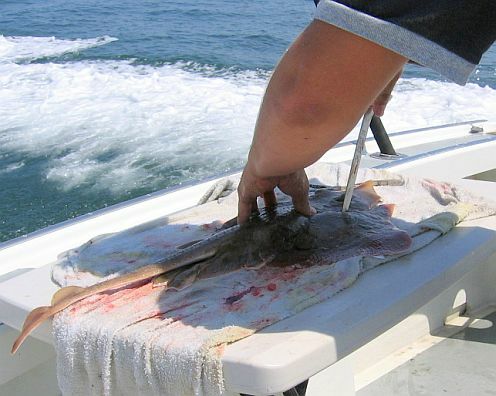 Dogfish (some people call them sand sharks) are in the same boat as the skates. There are lots of them on Long Island and when they’re around that’s all you can catch. And who wants to catch something you can’t eat anyway? But you can eat them. If you’re having doubts about this just keep in mind that almost all of the fish & chips consumed in England today is dogfish. This dish is traditionally made with cod, but when cod became scarce in the 1990’s dogfish was found to be an excellent substitute. There are 2 varieties you’re likely to catch: spiny dogfish and smooth. The spiny version has 2 painfully sharp spines near each dorsal fin. As you might have guessed the smooth has no spines. I eat both, but since I’ve never done a side-by-side taste test I couldn’t really say which I like better. Like skate there are no bones in dogfish, just a piece of cartilage that is very easy to remove after the fish is cooked. Preparation of these fish is simple, but you must do it soon after it’s caught or the fish will start to smell like ammonia. Your best bet is to clean them as soon as you catch them or as soon as you get back to the dock. Cut the wings off your skate and either throw the rest away or save it for bait. Kill the skate first if you like by piercing the brain with a sharp knife. There's no other meat to speak of, so just cut the wings off. Once the wings are off they have to be skinned. Use a very sharp knife to cut between the skin and the meat, or use pliers to pull the skin off. It’s a tedious process, but gets easier with a little practice. A Skinned wing. You'll get 2 of these from each skate. Dogfish are a little simpler. Just gut and skin. Some people drain the blood, but I haven’t tried that myself, so I can’t speak for its effectiveness. 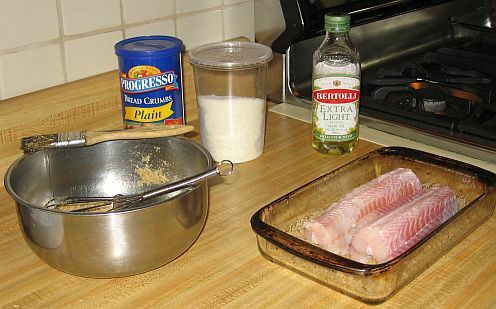 Once your fish is prepped you can cook them according to your favorite recipe. I like to bake mine on a bed of plain bread crumbs moistened with good olive oil and seasoned with a little Parmesan cheese. But these are a versatile fish, so cook them however you like. The flesh of fish in the shark family contains a small amount of urea as a byproduct of protein metabolism. If cooked or stored the urea will release ammonia causing an unpleasant smell. To solve this problem you must marinate the fish for at least 4 hours (overnight is best) in a simple solution of lemon juice and water. Place the fish steaks or fillets in a shallow dish and add just enough cold water to cover. Add 1/2 teaspoon of lemon juice or 1 tablespoon of cider vinegar for every pound of fish. Other vinegars will work as well used in the same proportion as the cider vinegar. You can use orange juice if you like, but since it is less acidic than lemon use 2 tablespoons for every pound of fish. Don’t afraid to experiment with different marinades. As long as they are acidic they’ll do the trick. Once the fish has been marinated just cook according to your favorite recipe. I highly recommend The Dogfish Cookbook by Russ Mohney for a boat load of recipes that work for either dogfish or skate. See how easily the cartilage peels away from the meat. Also note the long muscle fibers. Sea scallops don't look anything like this. Dogfish on a bed of bread crumbs ready for the oven. Cover with foil first. So there you have it. These fish are plentiful on Long Island, good eating, and easy to prepare. Now if they were only good fighters too. But hey, nothing is perfect. I'm not the only one who likes to eat unusual fish. In her blog Beyond Salmon Helen Rennie shows us a great way to cook skate.